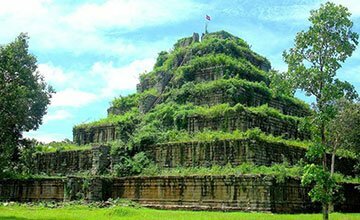 Banteay ChhmarTemples is located in Banteay Meanchey Province and about 20 km east of the Thai border and was constructed during the reign of Jayavarman VII in the late 12th or early 13th century. One of the temple’s shrines once held an image of Srindrakumara rajaputra (the crown prince), probably a son of Jayavarman VII. The long Old Khmer inscription found at the site (K.227), and now on display in the National Museum, Phnom Penh, relates how this prince or a king (samtac) was protected on two different occasions by four royal servants, all of whom lost their lives in his defense. The inscription lists the names of these officials and informs us that their respective images were once placed in the four corners of the shrine. Banteay Top it’s about 5km south of Banteay Chmar and this temple has five large sanctuaries that look incredibly fragile despite their size. The temple doesn’t look large, but satellite images show it at the centre of an area 800 metres long and 500 metres wide. It’s probably not such a good idea to go clambering within the temple confines — it’s all very precarious — but you can still get some lovely shots from the sidelines. Ang Trapaeng Thmor is a vast ‘baray’ or man-made reservoir, originally built by slave labour. Aside from being a staging ground for more than 300 Sarus Crane in the dry (non-breeding) season, more than 200 species of other birds occur here, of which 18 have been classified as globally or near globally threatened. 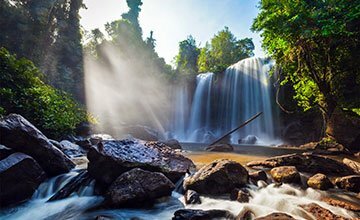 This is also one of the handful of sites in Cambodia where the endangered Eld’s Deer can be seen. The best time to see the Sarus Crane is from January to May though an abundance of bird species makes it a worthwhile birding site all year – it’s not uncommon to see 80+ species in one day. It is one of our favorite spots for birdwatching and reviously we have found scarce birds such as Black-necked Stork, Greater Spotted Eagle and, during March and April, Oriental Plover. 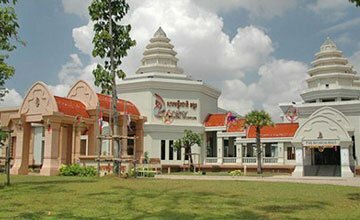 ATT is a day trip from Siem Reap, though basic accommodation can be arranged, giving birdwatchers the chance of dawn sightings and offering the opportunity of visiting the massive Angkorian temple complex of Banteay Chma. During the rainy season when we have few visitors SVC guides are training the local villagers in bird identification skills to maximise the opportunities for spotting the target species when SVC clients do visit, the fees for local guiding provide an incentive for the local community to look after their local environment and its fauna. A Conservation Contribution is Included in the cost of all SVC trips, which supports projects that benefit the communities in the conservation areas. At ATT the CC has been used to fund a rice bank, which lends rice to families and repair roads.